The 1982 NFL season was the 63rd regular season of the National Football League. A 57-day-long players' strike reduced the 1982 season from a 16-game schedule per team to an abbreviated nine game schedule. Because of the shortened season, the NFL adopted a special 16-team playoff tournament; division standings were ignored (although each division except the NFC West sent at least two teams to the playoffs, and the NFC Central sent four of five). Eight teams from each conference were seeded 1–8 based on their regular season records. Two teams qualified for the playoffs despite losing records (the Cleveland Browns and the Detroit Lions). The season ended with Super Bowl XVII when the Washington Redskins defeated the Miami Dolphins 27-17 at the Rose Bowl. A player's strike shortened the regular season to 9 games. The Redskins playing against the Dolphins in Super Bowl XVII. Before the season, a verdict was handed down against the league in the trial brought by the Oakland Raiders and the Los Angeles Memorial Coliseum back in 1980. The jury ruled that the NFL violated antitrust laws when it declined to approve the proposed move by the team from Oakland to Los Angeles. Thus, the league was forced to let the officially renamed Los Angeles Raiders play in the second largest city in the United States, returning football to the Los Angeles area proper following a two-year absence (the Los Angeles Rams left the Coliseum for Anaheim Stadium in Orange County in 1980). For the start of the 1982 season, the Minnesota Vikings moved from Metropolitan Stadium to the Hubert H. Humphrey Metrodome. The penalty for incidental grabbing of a facemask that is committed by the defensive team was 5 yards and an automatic first down. Now the automatic first down is omitted. The penalties for illegally kicking, batting, or punching the ball are changed from 15 yards to 10 yards. The league discontinued the 1979 numbering system for officials, with officials numbered separately by position, and reverted to the original system where each NFL official was assigned a different number. Also the officials' position was now abbreviated on the back of the uniform instead of being spelled out. This was the first season that the NFL began having the sack as an official statistic. For the first time all Sunday afternoon games began in one of two windows: 1:00 p.m. ET for early games, or 4:00 p.m. for late games. From 1970-81, most games began at 1 p.m. local time regardless of the home team, (except in Denver, where the Broncos kicked off at 2 p.m. MT). An exception to this rule was made for the Baltimore Colts, who were forced to begin no earlier than 2 p.m. Eastern due to a Baltimore ordinance which prohibited sporting events from beginning prior to that hour on Sundays. That ordinance was cited by owner Robert Irsay as a burden and as one of the factors for moving the franchise to Indianapolis in 1984. Miami finished ahead of Cincinnati based on better conference record (6–1 to Bengals' 6–2). Pittsburgh finished ahead of San Diego based on better record against common opponents (3–1 to Chargers' 2–1) after N.Y. Jets were bumped to the 6th seed from three-way tie based on conference record (Pittsburgh and San Diego 5–3 to Jets' 2–3). Cleveland finished ahead of Buffalo and Seattle based on better conference record (4–3 to Bills' 3–3 to Seahawks' 3–5). Buffalo finished ahead of Seattle based on better conference record (3–3 to Seahawks' 3–5). Minnesota (4–1), Atlanta (4–3), St. Louis (5–4), Tampa Bay (3–3) seeds were determined by best won-lost record in conference games. Detroit finished ahead of New Orleans and the N.Y. Giants based on best conference record (4–4 to Saints' 3–5 to Giants' 3–5). San Francisco finished ahead of Chicago, and Chicago finished ahead of Philadelphia, based on conference record (49ers' 2–3 to Bears' 2–5 to Eagles' 1–5). 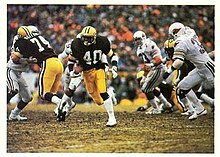 The Packers playing against the Cardinals in the 1982 NFC First Round Playoff game. Bold type indicates the winning team. Until this season, no team ever reached the post-season with a losing record. The Cleveland Browns and Detroit Lions both made playoff appearances with 4–5 records. It would be 28 years before another team with a losing record would make the post-season (however, this would be accomplished in a full season). The 1982 NFL Draft was held from April 27 to 28, 1982 at New York City's Sheraton Hotel. With the first pick, the New England Patriots selected defensive end Kenneth Sims from the University of Texas. Baltimore Colts: Frank Kush replaced the fired Mike McCormack. Chicago Bears: Mike Ditka replaced the fired Neill Armstrong. New England Patriots: Ron Meyer replaced the fired Ron Erhardt. Seattle Seahawks: Jack Patera was fired during the players strike after the team lost their first two games. Mike McCormack, the team's director of football operations, took over as interim for the remainder of the season.